As the air turns crisp and iPhone lines wrap around Apple Stores, it’s time for another annual fall tradition: Google’s official unveiling of its newest flagship Android phone, the Nexus. Google sent out invitations to an event in San Francisco on September 29, adding, “Join us for some tasty new treats and much s’more.” That makes sense considering its new build is called Android Marshmallow. The graham crackers and chocolate? Those are Google’s newest phones, the Nexus 5X and 6P, and they’re almost here. Motorola made the previous generation Nexus 6, a $650 phablet that left large swaths of people who wanted to hold their phone with just one hand out of luck. This year, Google’s tapped LG as one manufacturer for the 5X, a spiritual successor of the mega-popular Nexus 5. But unlike year’s previous, Google’s new Nexus will come with a friend. Chinese company Huawei, the first Chinese company to ever work with Google on the Nexus program, will be making the slightly large 6P, as this photo confirms by Google+ user Tiessen Fu. The Nexus 5X has a fairly straightforward, sleek design in the front: a 5.2-inch display with two long rectangular speakers on the top and bottom and front-facing cam. Compared to the 5, the 5X has a more refined rounded-rectangle style. On the back, there’s the LG/Nexus branding, a circular fingerprint scanner (a new addition for Android Marshmallow), as well as a protruding camera. A USB-C charging port will also replace the standard microUSB port. The larger 6P, with its 5.7-inch display, two front-facing speakers and camera looks, like the 5X in everything but size on the front, but the back is marked with a camera fitted inside a raised black bar that spans the entire top of the phone. Because nothing is as exciting as a phone that’s never lies flat. You’re also getting that round fingerprint sensor and appropriate branding on the back as well. Update: An uploaded press deck on Imgur leaves even less to the imagination when it comes to what’s hiding behind the 6P’s oddly shaped exterior, including “all-metal” design, Gorilla Glass 4, 3,450 mAh battery, all weighing in at 178 grams. These press renders below, obtained by Android Police, show that there are also some new color options coming to the family. The 5X will be available in Quartz White, Charcoal Black and Icy Blue (the color names themselves provided by an accidental leak by Amazon India). 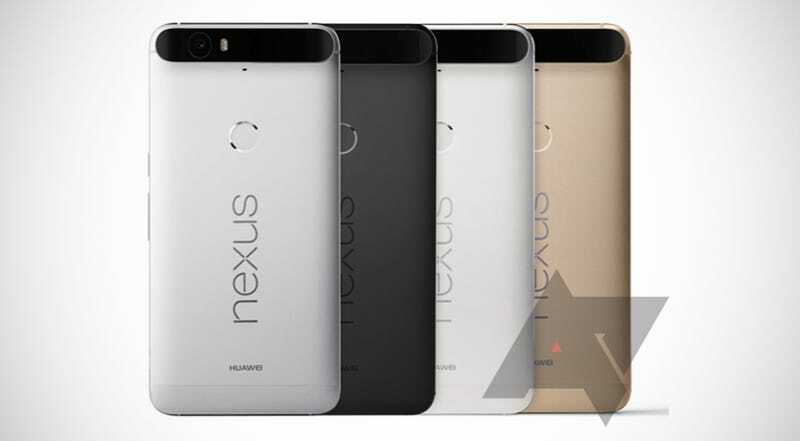 The 6P, on the other hand, will be available in silver, white, black and gold. The Amazon India leak also seems to show the specs of the 5X, with a full HD 1080p display, a rear 12.3 MP camera and a front 5 MP camera. The battery is a non-removable 2700mAh, which is better than the 5’s 2300mAh. As expected, the 5X will come standard with Marshmallow and a Qualcomm Snapdragon 808 processor. There’s a discrepancy regarding the RAM, however, with some sources - including the Amazon listing - saying it’s packing 2 GB, but other sources saying it’s got 3 GB. Unfortunately for those of us who need a lot of storage capacity, the 5X comes in 16 and 32 GB models, likely with no additional microSD slot. Big apologies to those who want their entire Peter Jackson movie collection on the go. The 5X is also much slimmer than the 5 as AndroidPIT shows in this rendered 5X versus real 5 pic. As for the 6P, Android Police and Pocketlint sources say a 5.7-inch quad HD AMOLED will be equipped on this one. Inside, there’s a Snapdragon 810 as well as a 3,500mAh battery, an even bigger battery compared to the Nexus 6. There’s still no exact word on the camera’s resolution, so we’ll have to wait and see. You’ve got to leave something as a surprise. With this guy, great size comes great storage capacity, and reports say the 6P will come in 32, 64 and 128GB models. This is the first time the Nexus will reach up to that super-sized number. AndroidPIT’s source says the 5X will cost less than $400, but there’s not a specific breakdown for the 16 and 32GB price breakdowns. That price is more in line with the 16GB Nexus 5 that began its life with a $349 price tag. It’s a large departure from the Nexus 6’s, which started at $649, and that may make the 5X more appealing. Update: According to Android Police, it looks like we’re looking at a starting price of $380 for the 5x 16GB version, $30 more expensive that 2013’s Nexus 5. Update: Android Police also has more deets on the 6P, too. That guy will start at $500 for (32GB) and work its way up. Looks like the era of a premium-priced Nexus is over. TalkAndroid reports that the phones will be ready for pre-order on October 13. There’s still no info on which carriers will be supported - if the trends from last year are accurate, the Nexus 5X and 6P should be available at all four major carriers. We also don’t really know who, other than Google, will be selling the phones that day. Make sure to write it in your calendar just in case. Update: Google will be launching the new Nexuses online only, most likely in a move to promote the Google Play store as the be all end all place for all things Google. However, the Nexuses have already been leaked on international Amazon outlets, so it might just be brick-and-mortar stores that are out of luck.